Climate and Location Playa Hermosa, Costa Rica. 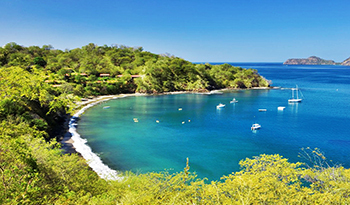 Playa Hermosa is located in the canton of Carrillo, between the Gulf of Papagayo and Playas del Coco. From the Daniel Oduber International Airport, located in Guanacaste’s capital city of Liberia, one can reach Playa Hermosa in an half hour through newly paved roads. Hermosa beach itself is approximately 3 kilometers in length, and is dotted by small restaurants and hotels. Condovac La Costa is the largest resort and is situated on the northern end of the beach. Condovac La Costa shares property with Villas Sol, a condo-hotel development in Playa Hermosa. 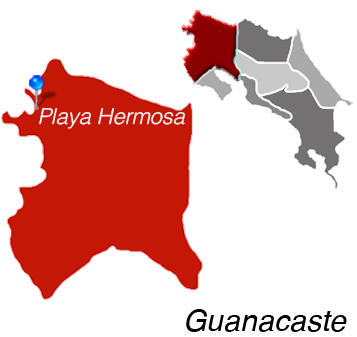 As for the weather, Playa Hermosa shares the same weather conditions found along Guanacaste. The average temperature throughout the year ranges between 78 and 95 degrees Fahrenheit, with the hottest temperatures occurring during the dry season from December to April. This is also known as the “high” season for tourists, and virtually every day features sunshine and clear skies.